Richard A. Hall, PhD, is adjunct professor of history at Texas A&M International University, in Laredo, Texas. Hall, Richard. 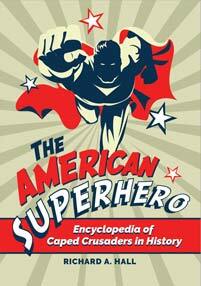 The American Superhero: Encyclopedia of Caped Crusaders in History. Greenwood, 2019. ABC-CLIO, publisher.abc-clio.com/9781440861246. This compilation of essential information on 100 superheroes from comic book issues, various print and online references, and scholarly analyses provides readers all of the relevant material on superheroes in one place.